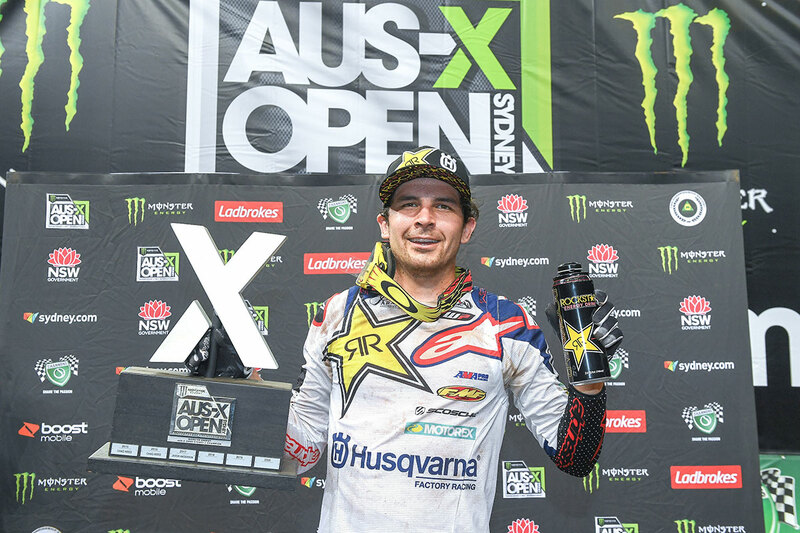 Dual AUS-X Open winner on his dominant 2018 showing in Sydney. 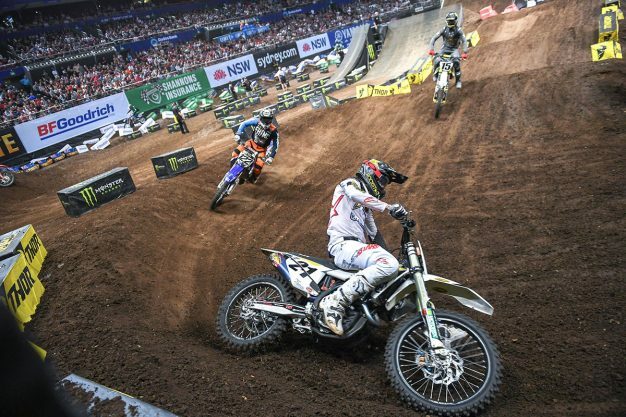 As the current Monster Energy AMA Supercross champion, it was a big deal to have Jason Anderson travel down to Australia for a second-straight year to contest the Monster Energy AUS-X Open. And, as anticipated, the Rockstar Energy Husqvarna rider delivered a dominant performance at Qudos Bank Arena in the 2018 edition with all three SX1 victories. MotoOnline.com.au spoke with the 25-year-old American post-race to get his take on the first-ever Triple Crown in Sydney. Congrats on a second-consecutive AUS-X Open victory, you must be stoked! Yeah, thanks! A second victory in a row at AUS-X is super-cool, I love this event and am hoping to keep it on my schedule every year. I’m just trying to get better and better as the years go on and I feel like this year was a little bit more intense racing than last year. Obviously, on the first night last year I crashed and had to come back to second, but this year those three starts in a row… wholly crap it was intense, but it was good. It was a different format this year, with just the one main night but a Triple Crown format as you mentioned. What were your thoughts? I think it was cool. Sometimes the long moto mains kinda get boring, but even like that last one I kind of just had to stay behind Chad [Reed] because the track was slick and you could make a mistake. I was able to stay behind him, get second and go 1-1-2, so that was cool. I think those three races make it intense, because sometimes if a guy gets out front in a 20 they just cruise by themselves, so it was cool to get out there and do some battling [laughs]. I mean, between me and [Justin] Brayton, me and Deano [Wilson], me and Reedy, I think it was exactly what the format was built for. One thing I did notice, especially in your heat race, was that you were one of the few who was able to make your way through the pack and put the bike where you wanted to as you made passes stick. That was impressive considering the track conditions. Yeah, in the heat race the track had a little bit of traction, so I was able to kinda get around guys a little bit cleaner. When it got slick, there’s really only one good line and you’re always searching for that cushion, then when you try and move you push the front or whatever, so it’s kind of hard to get a pass in on someone. It worked out well though. The last final, obviously Chad took the Shannons Shortcut twice and was penalised afterwards. Were you aware of that at the time? Ah, in the last one I saw him take the Shannons Shortcut and I was like, dang dude! I thought everyone took it on the second one, cos like, in the second one I went from first to fourth, to second, and I was like… pretty sure everyone took it. I almost thought that it was okay to do it more than once, so I almost did it again. I was like, you know what, there’s no reason to push the issue. To wrap it up, you are the defending AMA/world champion and are back here for a second year in a row, which is massive for Australia. Like you said, the plan is the hopefully keep coming back to Sydney, right? Yeah, this event’s awesome and it’s fun. It’s kind of a good tester to see where we’re at as far as fitness and race-craft and stuff like that. And it’s an enjoyable event, kind of like we’re still productive, but it’s also a nice little break. That’s one of the better parts about it because we ride so much that it’s nice to come here and race a little bit. For us it’s like, we want to win every time we get out on the track, but it’s an enjoyable race. If it doesn’t go good, it doesn’t go good. You know where you’re at, you still have a whole month to get ready [for Anaheim 1].